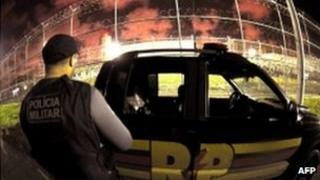 Prisoners at a jail in north-eastern Brazil have released all the people they took hostage during a riot. Some 400 prisoners in Aracaju started a revolt over the weekend and were said to be armed with knives and three rifles stolen from a weapons room. They accused guards of mistreating them and demanded better conditions, as well as greater respect for female visitors. Officials said the hostages were freed unharmed, after the authorities pledged to investigate the inmates' complaints. There had been 24 hours of negotiations between officials and prisoners. The five leaders of the rebellion were transferred to another prison. Three of the hostages were guards, while the rest were relatives of prisoners who were visiting the jail at the time the riot started, police say. Originally about 130 people were taken hostage but 28 were released on Monday morning. The Public Safety Secretary for Sergipe, Joao Eloy said most of the demands made by the inmates could only be met only by the court system, he told the Agence France-Presse news agency. "We did all that was possible and reasonable and will investigate their complaints," Mr Eloy said. But he said other demands were unacceptable, such as the call for the prison governor to be removed. Prisoners accused guards of committing abuses and say they will give a list of names to the local authorities. They also complained that women visitors were the subject of abuse. More than 150 police officers were sent to the facility in Sergipe state to deal with the crisis. Overcrowding has become a major problem in Brazil's prisons. The Aracaju jail was built to house 2,000 people but is now holding approximately 4,000.